David Bockman grew up in California and was ordained a rabbi at the Jewish Theological Seminary in New York in 1986. Since that time, he has served pulpits in Kansas City, Maryland, New Orleans and North Carolina. A fifteen-summer veteran of Camp Ramah, Rabbi Bockman enjoys an innovative and creative approach to Jewish life. As a Seminary student, he won the Henry Fisher prize in homiletics, the Solomon and Rose S. Lasdon prize for creativity in translating Guys and Dolls into Hebrew, and first prize in the UJA/Morris Kaplun university essay contest. Rabbi Bockman has studied physics, linguistics, music and literature as an undergraduate at the University of California at San Diego. In addition to his Master of Arts in Jewish Studies and rabbinic ordination, he has completed course work towards his PhD in Jewish Philosophy, focusing on the post-modern French Jewish philosopher Emmanuel Levinas. He has taught Jewish History at the University of New Orleans, and developed adult courses on Jewish philosophy and the musicals of Stephen Sondheim, oppression, and the nexus between 20th century math and Judaism. Rabbi Bockman is proud to be married to Vicki Hyman, a newspaper reporter who grew up in Monsey, NY. Their delightful son, Theo, contributes to services with his humor and love of Judaism. They enjoy living in Bergen County and facing the challenges of ready access to kosher food and abundant Jewish and Israeli culture. 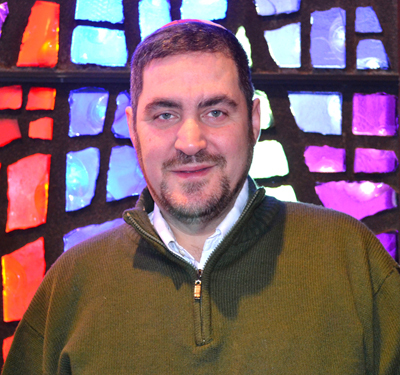 Rabbi Bockman, since becoming the spiritual leader of Congregation Beth Shalom, has brought great vitality to all Shabbat and Holiday services and by leading many adult classes at CBS. There's an Israeli dancing class, Adult Bar/Bat Mitvah classes, Hebrew Poetry, among others. He is known for playing jazz trumpet and shofar in klezmer, gospel and jazz groups, including performances at the New Orleans Jazz and Heritage Festival and the House of Blues. His Jewish musical projects have included the vocal quartet ‘Beignet Yisrael’ and the smooth jazz trio ‘Rabbi, Russian and Blonde.’ He even performed a Duke Ellington piece at Congregation Beth Shalom's Interfaith service for Thanksgiving. This week’s Torah portion contains quite a lot, including the rock-striking incident, the healing of a plague of biting snakes, and the deaths of both Miriam and Aaron. But it also contains a very short song, considered (strangely) by the Talmud to be one of the three major songs in the Torah. (The other two are the Song at the Sea and Ha’azinu, both, like this week’s, prefaced by the words “az yashir, “then sang....”) The Talmud even specifies that those three songs were sung, alternating, every Shabbat afternoon before the late afternoon sacrifice (mincha) as the day was waning. It is certainly clear where each of the songs begin, and where the other two songs end. But our little song about a well springing up, while clearly beginning in Numbers 21: 17 ( “az yashir Yisrael et ha-shirah ha-zot, ali be’er … — then Israel sang this song, ‘spring up, oh well…’”), does not necessarily end with references to the well, contained in that verse and the next. Instead, the subject seemingly changes halfway through verse 18, becoming a travelogue — the sort of travelogue most people tend to skip when reading through the Torah: “…and from Midbar to Matanah. And from Matanah to Nachaliel, and from Nachaliel to Bamot. And from Bamot to the valley that is in the field of Moab, the top of Pisgah, overlooking the Yeshimon.” It is only here, at the end of the fourth verse, that the Torah inserts a space, seemingly concluding the quoted song. The Torah brackets the poem in this manner, although most translations set off the first verse-and-a-half as clear “poetry mode,” returning to “run-on narrative mode” for the travel verses, indicating those editors’ decision that the latter verses were not intended to be part of the poem or song. Are those verses part of the Ode to the Well? Do they rise to the level of art? Or are they merely a plodding recitation of place names, mile markers, or way stations on the road to … wherever they might have been going? One thing on which almost all commentators — midrashic, medieval, and modern — agree is that these place names are not actually the names of places! Although they all seem to describe Moabite topographic reality, none of them is specific, or related to any known site. Midbar (desert), Matanah (gift), Nachaliel (“arroyo of God” or strong wadi), Bamot (raised or high places), Pisgah (peak), Yeshimon (wasteland or desert escarpment). They seem, in the aggregate, to present a sort of map of life’s vicissitudes, from the flat desert to the peak of strength and visibility, falling back to a vast empty wasteland. Indeed, the talmudic sage Rava was pressured to explain these verses just before Yom Kippur in tractate Nedarim (vows, ironically, just before what came later to be the disavowal of vows known as kol nidrei). He explains that “when one becomes as selfless as the desert (midbar), he can be given the gift (matanah) of Torah, and inherit God’s companionship (nachali-el = ‘inheritance’ of God), but if he raises himself up high (bamot), he will find that he will be knocked down to the level of the flat plain (s’deh Moab), or even the empty wasteland (yeshimon).” Such an explanation is certainly a proper preparation for Yom Kippur, when we naturally think of choices we make that shape the broad vistas of our life, but does it give us any insight into the question of the poetic nature of these verses? Looking, however, at the context of the parasha, with the deaths of Moses’ siblings, his troubles with the rock and water, the foreshadowing of his ultimate fate (not entering the land he’s been heading towards these past forty years), how can we help but see in these verses the heartbreakingly tragic scope of his life? For even Moses, the greatest of the Israelites, started out with nothing. He received his life as a gift, clutched from certain death in a basket floating on the Nile. He became God’s best friend and brought Torah to the world; yet he, too, was destined to face the vast wasteland, empty and depressed, the lowest point on the surface of the earth. The pathos, says Nietszche in his “Birth of Tragedy” — the book that describes his philosophy of art — is not when a baby dies or when a terrorist murders people for no reason. Tragedy, the ultimate art in life, is the ache we feel when we realize that even the greatest heroes, the pinnacles of human achievement, are subject to a senseless destiny, the end of their existence. As much as we try to structure what we do to keep the howling wilderness at bay, we cannot completely shut out the fearful chaos that crouches, drooling in anticipation for us all. In this sense, these verses about traveling — the start from nothing, the undeserved gift that is life, the opportunity to connect as well as achieve, along with the inevitable drop to face the wasteland of oblivion — are one of the highest forms of art, appropriate for the waning moments of Shabbat or Yom Kippur. As the last rays of a darkening sun angle into the growing gloom, we find ourselves alongside Moses, hoping against hope to hold fast to all that we have cherished — our family, our career, our ultimate goal — as they slip through our weakening grasp. Now (too late? ), we see how all that we had came out of a desert, presented to us as a gift. Even physics wonders at the existence of anything, an aberration arising from the quantum foam, a bubble as improbable as the inflated housing prices, that were gone in an instant. Can anything survive the relentless arrow of time? One final commentary asserted that the huge emptiness into which a stunned Moses must have stared was large enough to contain a well or cistern. At the end of his journey, the boy who floated on water, who led his people through walls in a sea of water, who took his staff and hit a flinty rock bringing forth gushing water, he was presented with a vision of an emptiness that could cradle a well overflowing with water, enough to sustain future generations. Even as his star fades, the work of art that was Moses’ life, the Torah he brought down to confound all probability, will live on beyond his limitedness. As can we all, if we but use the improbable present we’ve been given to full effect. The end of the journey is determined, but what we do along the way is wide open, waiting for nobody but us! “I’ve always done a lot of musical things in whatever synagogue I work for,” said David Bockman, rabbi of Congregation Beth Shalom in Pompton Lakes. “It’s a part of how I am as a rabbi. Every rabbi is different in his job,” he added. Bockman, who has played trumpet since fourth grade, said he played in a number of bands at school — from marching bands to jazz ensembles to orchestras at school musicals. Still, the two parts of his life often intersect. “Some people view [the rabbi] as the CEO of a synagogue, but every rabbinate is different, depending on the rabbi’s skills and strengths. Part of my rabbinate is music,” he said. 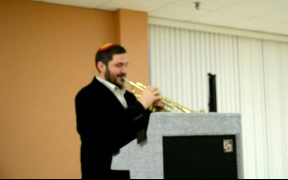 Being a rabbi, however, is never far from his mind, even when he’s jamming. 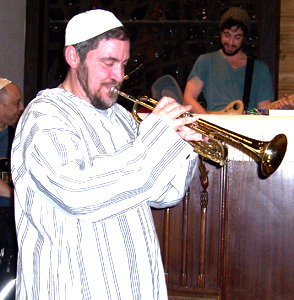 While working in New Orleans, Bockman said, he was part of the local music community, inviting area musicians to his synagogue for jam sessions on such occasions as Purim. “It meant something to the musicians,” he said. “They asked about it every year” in anticipation of the event. After Hurricane Katrina, Bockman led a “New Orleans style” jazz funeral at Cooper’s Pond in Bergenfield before Selichot. “It paved the way for the determination to change and better ourselves and the world, which are the core themes of Selichot,” he said. Bockman said that playing the trumpet, specifically, has affected his davening. In addition, Bockman said, “I can help knit together a group of people harmonically when everyone is playing or singing together. “My contribution never works as well with me as the only or featured soloist, but rather as a facilitator of harmony, of enhancing a shared musical experience.